RIO DE JANEIRO – Members of the public vocalized their approval of the Prefeituras “Shock and Order” campaign. The campaign is based on a zero tolerance approach towards disorder in the city. “Shock and Order” was originally introduced as a six month trial temporary measure. The campaign has however been happily received by the vast majority of “Cariocas”. To such an extent that many citizens have been writing and phoning the Prefeitura giving reasons for the campaign to become permanent. Cycling into traffic, Photo by Philip Sever. People are tired of the disobedience and general bad behavior prevalent in Rio. Cariocas are particularly tired of the fact that not only is disorder common in Rio, but also the police and other law enforcers seem to walk the other way when something wrong is occurring. The “Shock and Order” campaign has shown people how zero tolerance policing can have positive results and reduce disorder. It is common in Rio to see buses stopping in the middle of the street to collect passengers, in some cases in moving traffic so the potential passenger has to board the bus while surrounding traffic is moving. The Prefeitura is determined that this should stop, and several buses have already been fined on Avenidas Rio Branco and Presidente Vargas. The strictness of the Shock and Order campaign can also be seen in prosecutions of cyclists. By law and by common sense, cyclists should always ride with traffic. 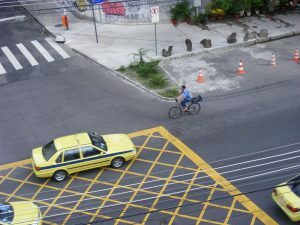 However it is common to see cyclists in all parts of Rio riding against the traffic. Cyclists seen riding against traffic are now being prosecuted. Another common sight is cyclists using the pavement rather than the road. This also is prohibited unless there is signage specifically indicating that cycling can take place in that area. Previously police and other law enforcers took no notice of these minor offenses, but the Prefeitura is no longer willing to accept these offenses, serious or minor. The Shock and Order campaign was seen in action at the Vasco da Gamma vs. Flamengo match at the Maracana(March 22, 2009). The Secretary for Public Order sent the municipal, civil and military police and over 200 cans of beer, 150 units of soft drinks and mineral water, 40 club shirts, 27 flags, 176 rain umbrellas were seized from illegal vendors before the start of the game. Two men were also arrested during the seizure for contempt. Ricardo Ismael, professor of political science at the University of Rio de Janeiro (PUC-RJ) thinks that an advertising campaign should be launched to make Cariocas more knowledgeable of the law. Some of the practices mentioned previously have been happening for such a long time that many of Rio’s citizens probably do not know that some of these practices are illegal. Other cities such as New York have seen the benefits of a zero tolerance approach towards crime. Crime is a major issue in Rio if not the number one issue. The solution to this problem will not be achieved solely by the “Shock and Order” campaign but enforcement of the law whether minor offenses or serious violent crime seems to be a step in the right direction.